I just love a crazy full, infinite Instagram feed, so I follow a lot of accounts, but there are a few stand-out Instagram accounts that I check in on a few times a week to make sure I haven’t missed a single post. @nadianizamudin is one of those accounts, I stumbled upon her work one evening and then had to browse her entire back history. I love her use of color, embroidered embellishment, and playful collage. In this new monthly feature, “Instagram Crush,” I had the privilege of asking this inspiring artist and Instagram creative about her work, process, and thoughts on marketing, balancing a day job with her creative passion and her advice on how to find the Muse when you’re stuck. She was so generous and thoughtful with her answers, I hope you’re as motivated by her devotion to keeping up with her artistic process even as she commutes between three cities, travels for a high-pressure job and spends time with her family! Read on for the interview and more images from her breathtaking Instagram account! Berry from Trial by Inspiration: What prompted you to start your Instagram? 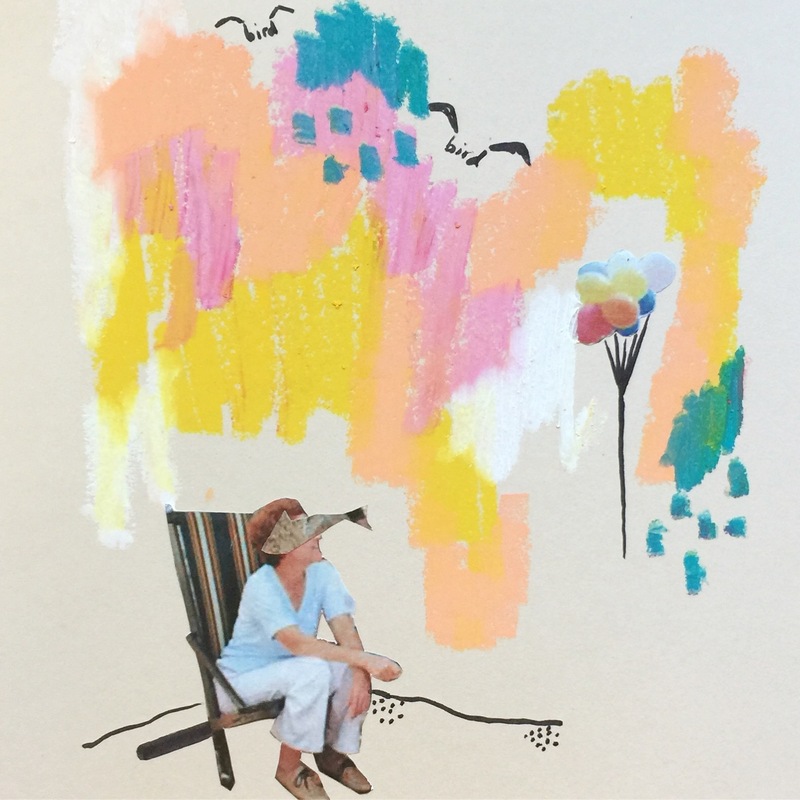 Have you always been into painting and collage? 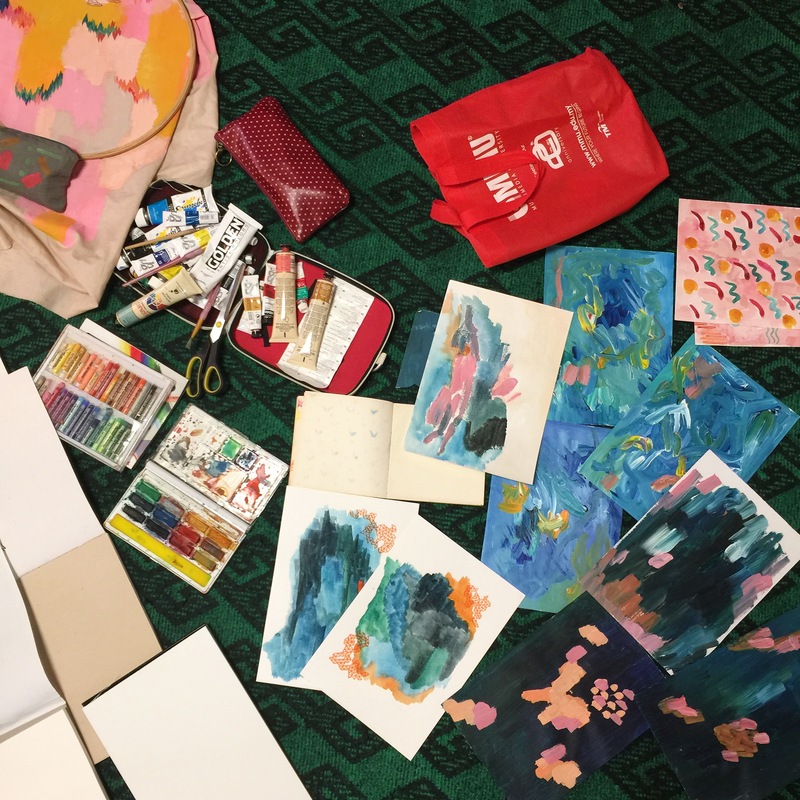 Nadia Nizamudin @nadianizamudin: I have been resisting the idea of having an art Instagram because initially, I have always thought that artists should be ‘discovered’ instead of marketing themselves. However, after following a slew of my favorite artists and seeing their growth through social media communities and support, I began to think that maybe I should put my work out there. It was also partly self doubt – I did not have a formal arts education – and I allowed that got into my thinking. Talking about style, I have always been painting since I was a kid but it was mainly restricted to watercolor painting because of its accessibility and price. Collage was also my favorite go to art; it was easy, and I love creating a whole new narrative to the original images. NN: I live in Nilai, Malaysia, but I also spend time in Subang Jaya every week to visit my in laws. Nilai is a small town about 45 minutes away from Kuala Lumpur, Malaysia’s capital. But because I work in the heart of the city (in the Golden Triangle where the KLCC Twin Towers are) it’s just easy for me to say I am from Kuala Lumpur because it’s where I am most of the time. So in a way, I divide my time equally between these three places. Kuala Lumpur is your typical thriving bustling city. It’s like any other city in Asia – Singapore, Jakarta, Bangkok – with its tall buildings and malls and traffic jams. It’s also where the arts workshops or festivals are located. Subang is a quiet surburb with its own small center of shops, cafes, and malls. I grew up in Subang and most of my resources are in this town out of comfort. 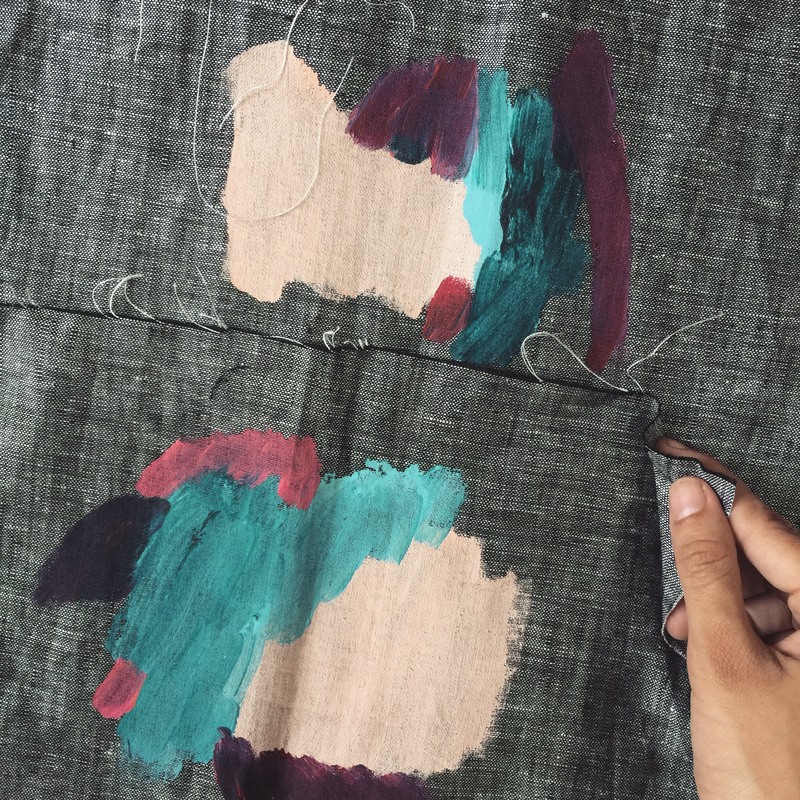 Subang is where I have my screens printed, my textiles stretched and framed, my products sewn. Nilai is a sleepy town where my parents are. It’s quiet, the weather is always stifling during the day, but relaxed. My studio is in Nilai, and I work with the sounds of birds chirping, squirrels running around. TBI: Your work has this great spontaneous, narrative quality, how much is your process about planning and how much is trial and error? NN: 99% of my work is spontaneous and in that moment; I do not have an idea what I would do until I am in front of my table and flipping magazines. the 1% lies in knowing that I want to do that particular day. For example, I would tell myself that I wanted to do collage on the wood block. If I’ve not painted the blocks before I would spent about twenty minutes painting them – immediately I knew just what colors I would use – and while the wood block was drying out I would flip through the magazines for my images. I would never know what it would be, all I knew it that something would catch my eyes and the rest will follow. It is the same thing with my textile art, which is why I love it. Painting the fabric is fun, there’s no rules to it. I always paint using one brush because I love how the colors blend. 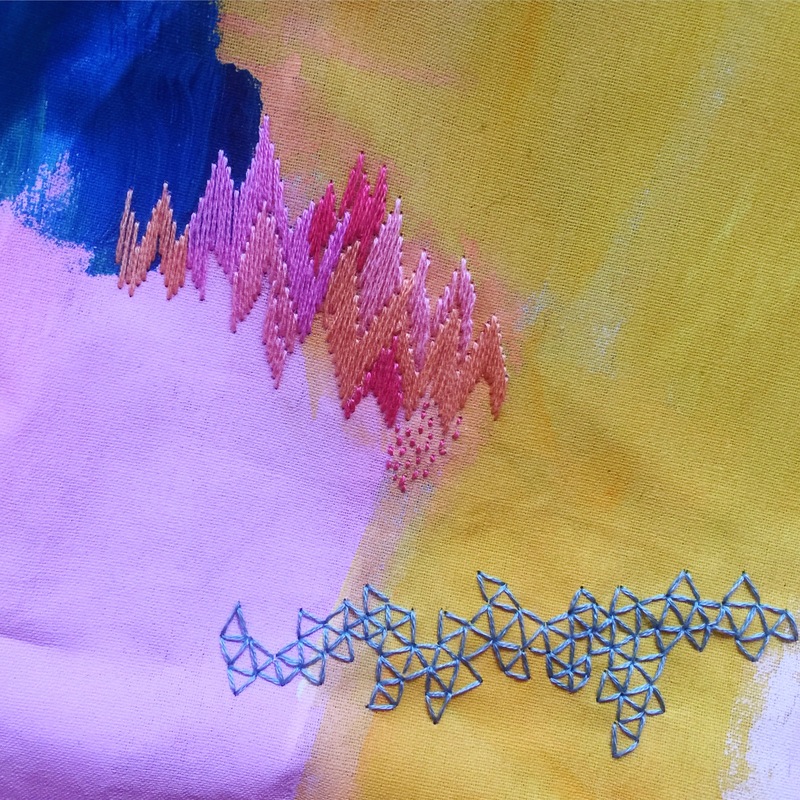 I do take some time to go through the colors of my embroidery thread, just so that the colors go together. But the embroidery is all purely fun and uninhibited. I would say the only thing that I plan if my printmaking. I would go through the process of knowing what I plan to carve on my blocks (eg: leaves, or birds) or what I plan to have on my screens. I also have to plan the colors beforehand, the fabric choices. Printmaking is a much more organized art for me, with sketches and color palette swatches. NN: I have a stack of magazines on my table that I keep for collages. I always like to make my collage pretty and cheerful, something that would brighten up a room or an area or get people to talk. So the first thing I do is to choose the people in it. I like it if they are doing something, engrossed with their work. I would add some illustration if the collage was on paper. The colors I choose were mostly instinctual although I hardly stray from pinks, oranges, yellows and blues. Currently for my woodblock series I add butterflies I got from an old encyclopedia of butterflies and for this particular work I would take my time to choose the size and colors of the butterflies to go with the other images. NN: If I HAD to choose, I would say end product. As much as I enjoy the process I love the gratification of seeing the finished work, especially if I love it. I still get affected over works that I don’t quite connect. I am a runner and I find that the art process is the same with my running; there are many days where the running itself makes me feel tired but I am always always triumphant and happy after its done. I am not tired doing my art but on days where time is pressed or life takes over you just want to do a small thing and call it a day. Which is why I reserve a small sketchbook which I do daily with my oil pastels and ink. I always finished it, and I am sated and happy. TBI: Do you have any tips for how to get unstuck creatively, when you can’t find your muse? NN: I have a sketchbook that I keep and go to when I find that I cannot continue with my current work. I give myself permission to doodle, make a mess out of it. It breaks the monotony of my thought and focus from the work I am stuck in to something totally new. I also paint with my little girl – she has inspired my color choices many many times. I do other side projects – mostly crafts. I also use this time to focus on tasks that don’t require creativity: admin stuff, emails, studio organization. If all fails, go outside, watch a movie, exercise, eat indulging food and laugh. TBI: Do you have a day job? How do you balance your professional time with your creative time? NN: Yes I do. I have a full time job as an Instrument Engineer for an oil and gas company. It’s a hectic, demanding work that sometimes requires me to travel for a period of time, living in places where doing art is not as accessible. Also, it is technical and I have to undergo technical competency test every year. It’s exhausting, and my art suffers a little during the exam time. I work on my art in the evening after work. I probably get about 30 mins to 1 hour each night which is why planning my schedule is a MUST. Weekends I go all out. This is mainly the reason why artwork is mostly in smaller sizes (collage work, painting) so I could cut the finishing time, and why they are also portable (embroidery, collage). I would love to go back to painting big canvases again but I am impatient to get to the end result and often lose steam halfway due to mental fatigue of juggling work and life. TBI: Do you sell your work? How can people get in touch with you? NN: I do, but I do not have an online shop at the moment. I mostly sell my work in art bazaar and art fairs, and online, customers contact me directly. I am currently committed to doing a lot of shows and exhibitions so my focus is mostly on making more work. I keep telling myself to set up an online shop and it is halfway through so wait for it! I am still at the stage where I am absolutely enjoying doing this and feeling quite attached to every single pieces I made. It’s always a bittersweet feeling when I say goodbye to one! For the moment I am contactable through my Instagram account @nadianizamudin. My email address is nadianizam@gmail.com. Thank you so much, Nadia for your candid conversation about your work and Instagram! Your commitment to make time for your art by painting with your daughter, traveling with a sketchbook and balancing the scope of each piece with your real, available time inspires me! Please keep us up to date on what’s next for you!